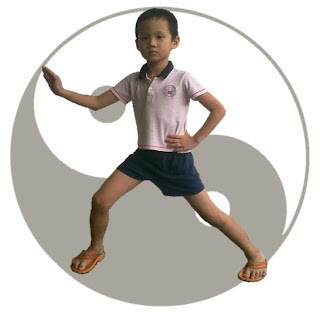 Taijiquan or Tai Chi Chuan (太极拳) is the application of the Taoist philosophy concept of Yin Yang (阴阳) in the human body. The concept of Yin Yang is about opposite energy in unison, balance, motion and flow. Taijiquan uses this concept to form a motion meditation for the mind and body. The Chen Style Taijiquan (陈式太极拳 , 陳氏太極拳 or 陳式太極拳) is the oldest form of all recognized orthodox family style taijiquan which include the Yang (杨), Wu (吴), Sun (孙) and Wu-Hao (武-郝). Chen style taijiquan is characterized by its silk reeling (缠丝劲), alternating speed motion and bursts of power (发劲). It is the only style of taijiquan practiced mainly for combat, followed by health. The rest of the styles are practiced more for health reason. My name is Tan Hiang Ching, 陈贤振 (Chén Xián Zhèn) in Chinese. I had been learning traditional martial arts from about 8 years old from my father. For the past 5 years, I had been actively practicing and researching the Chen Style Taijiquan Lao Jia and I would like to share my experience, knowledge and findings into this once secretive fighting skill.